At New Zealand Fashion Week this year, I was entranced by how much the digital landscape had shaped and was shaped by the trends set on our runway. Pride of place was given to bloggers while the shutterbugs flashed from the front row, as well as the paparazzi pit. The dubious qualification of being a blogger for the first time permitted fashion enthusiasts to sit sideline with the power buyers and media darlings. It certainly felt like a social (*media) revolution. 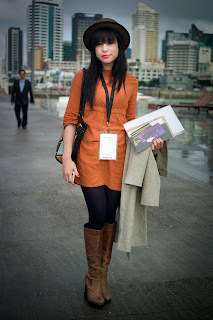 I’ve been attending New Zealand Fashion Week for some 8 years now. Next year will be my 9th. In that time, I’ve seen it move from Auckland’s historic Town Hall to the wind tunnels of our Alinghi base at the Viaduct, to it’s final resting place; the spanking new Viaduct Events Centre. If the shiny newborn venue lacks the tired majesty of the old Town Hall; it more than makes up for it in mod cons. Controlled temperature and acoustics, free wifi, (though I doubt there was such a thing in 2003), multiple luxe bars and finally, VIP areas backstage. Proper stage and seating facilities ensured swift turn around and fashion shows that – shock horror – actually ran to schedule. Not that I would have been aware of any of this finer detail in 2003. Luckily, I wasn’t a fashion reporter then, I was a lowly model. Essentially I was a glorified living statue, paid to inhabit the Powder Room where the VIP’s and celebrities could come escape the madness, sip champagne and be pampered away from the melee outside. But I didn’t care. I would have cut off my right arm to stand there and simply inhale the fabulosity of all the fashion. Everything was tinged with the magic and beauty of perfection and each morning at 5am I cheered when my alarm went off because it was another day I was paid to work in heaven. If I’m honest, I still feel that frisson of excitement at the start of every fashion week. But there is a difference. In the early years, I was so excited to be there, I thought every single show was the best ever. In The Whole Entire World. I hadn’t even heard of half the designers and I certainly couldn’t have passed comment on the evolution of their designs. I had no concept of their commercial viability, integrity of construction, nuances of inspiration or the financial, emotional and cultural investment from the design team. I was, as most 19-20 year olds are, largely ignorant of the wider implications of pretty much anything in life that didn’t wholly match my own limited experiences. I’m not saying I’m much wiser now. Nor am I any more educated or expert in my chosen art form. But I am more considered. I take time to digest what I’ve seen before I form my opinions on fashion shows. I am careful in my choice of words and how I portray others. I appreciate the epic efforts involved in the trend-storm that is Fashion Week. The hours of orchestration and the years of blood stitched into every seam. I know my own tastes and the aesthetics I am drawn to. I have an awareness of the dark and moody caricature our fashions paint onto the global perspective of New Zealand, as well as the historical persuasions that led them there. In short, I think before I speak. Which is why I find it curious that half my invites this year were addressed to Katy Thomas – BLOGGER instead of Katy Thomas – Broadcaster. While I am both, the TV2 audience is significantly greater than that of any online kiwi publication. Nor do I understand the superhuman effort to prioritise bloggers (general) instead of bloggers (specific). Blogs are only of value if the writer’s readership matches that of a label’s target market. Pretty much anyone with a finger and a pulse can write a blog. That shouldn’t signify that what they have to say is either meaningful to your audience or the end consumer. Or that their brand adds to the designers own. Put it this way: if Trelise Cooper got a favourable review in “The Truth” I doubt she’d be skipping all the way home. The irony here is, I’ve embraced social media from the outset. I love to tweet; my facebook page is at capacity and I am a featured guest blogger for Social Media New Zealand, FashioNZ and Thread. According to Klout, I’m as influential about fashion as Karl Lagerfeld! Go figure. Yet I would warn designers to be as selective in their guest lists as ever before. Bloggers have truly earned their place at fashion week and those that offer sound, incisive commentary have as valid a contribution as any journalist. However, to celebritize them and laud their appeal is short-sighted. Today’s blog will be buried beneath a hundred more posts within a month. But a quality fashion publication, prime-time news piece or exultant buyer will outlast the seasons and continue to drive happy customers to the door. Fashion Week, you have been warned.